When I was in high school, I had no idea what I wanted to do, be, or even study until my first chemistry class. Here we were performing flame tests, simply observing the colour of the flame when burning different metals, and that was it – I knew what I wanted to do, be, and study! In 2009 I enrolled into a Bachelor of Science at the University of Melbourne, excited to study the wonders of the universe, learn about the physical and natural world, and work towards my dream of becoming a chemist. During this time, I had the opportunity to study the practical and theoretical aspects of chemistry in depth, develop critical thinking, and practice independent research. I studied analytical chemistry, environmental chemistry, organic chemistry, computational chemistry, all areas of chemistry! I went on to complete a Master of Science at the University of Melbourne where I majored in organic chemistry. During those two years, I further developed my skills as a research chemist, had the opportunity to work with world class scientists in world class facilities, and even got a paper published. I discovered that you need passion, perseverance, and determination to become a great chemist. After my time at the University of Melbourne, I went on to complete a Master of Science Communication Outreach at the Australian National University. 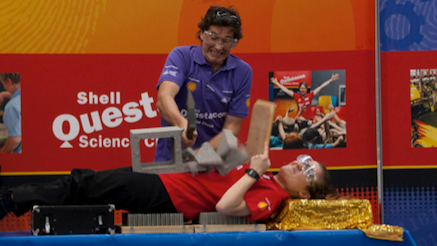 This included touring around Australia with the Shell Questacon Science Circus and performing science shows and workshops to kids, adults, and communities. Not only did I get to travel to regional and remote parts of this beautiful country, I had the opportunity to share them my excitement for chemistry, science, technology, and engineering! Since 2016 I have been working as a science communicator with the Cambridge Science Centre. Now I perform science shows and workshops to kids, adults, and communities in the UK. Everyday I get to connect with others, share with them my favourite science experiments, discoveries, and facts, and get them excited about the endless possibilities of science! There’s no one right way to communicate science, and I’ve come to realise that, just like when studying chemistry, it takes passion, perseverance, and determination to become a great science communicator! Bec has since returned to Questacon and as part of the Smart Skills Initiative, which coordinates a suite of programs that engage young people in innovation, technology, engineering and design thinking through exciting, hands-on challenges, projects and workshops.